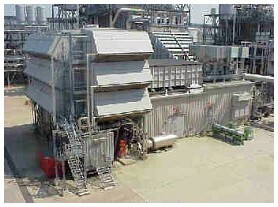 ELSTA, the "Electricity and Steam Association", owns a gas-fired, combined cycle cogeneration facility located in the Dutch province of Zeeland near to the city of Terneuzen. The facility generates both heat and electricity for the Dow Chemical facilities in Terneuzen as well as electrical power for the public grid. The ELSTA facility is a joint venture of DELTA, Essent and AES. The facility consists of three gas turbines with a connected Heat Recovery Boiler, generating 123 MW electrical power and 450 ton/hour steam (90 bar) per unit and a steam turbine unit producing up to 90 MW. 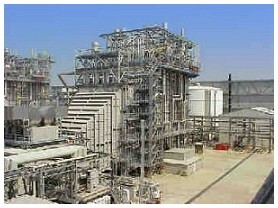 The steam turbine is also used for controlling the steam pressure to the Dow facilities. The plant is operated as a flexible production system, based on request, for steam (350 - 850 ton/hr) as well as for the generated electrical power. As a result of recent investments in new Low NOx combustion systems the facility is now one of the cleanest gas fired electricity generators in Europe.